More than 600 homes have been destroyed since the volcanic activity began. 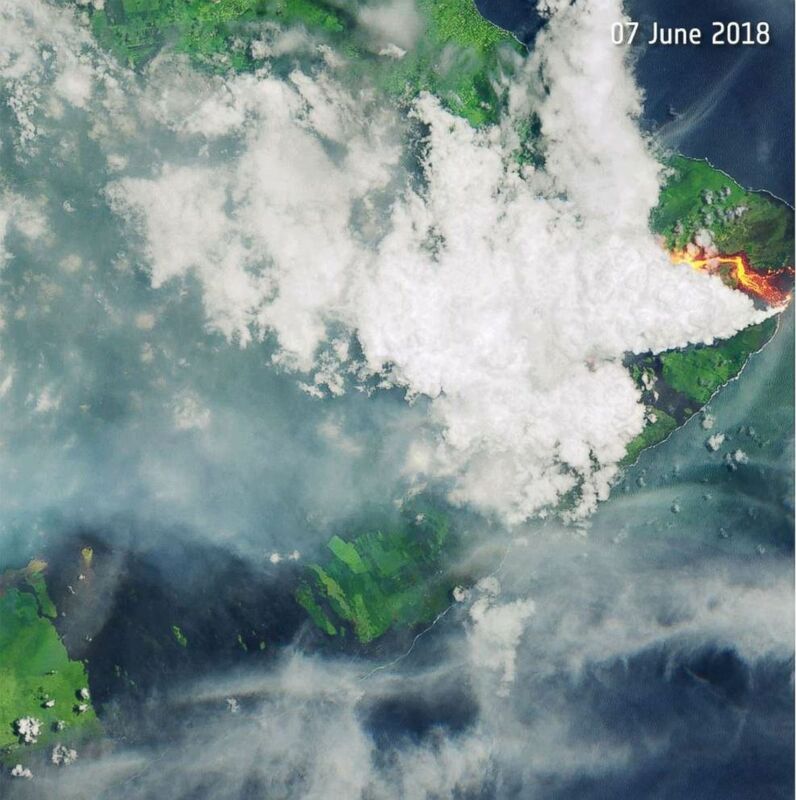 Satellite images over the Kilauea volcano on Hawaii's Big Island taken before and after the latest eruption show just how much the environment has changed as a result of the lava. The images were released on Friday by the European Space Agency. In the first image, taken on May 23, the active volcano is visible through a sparse amount of clouds. 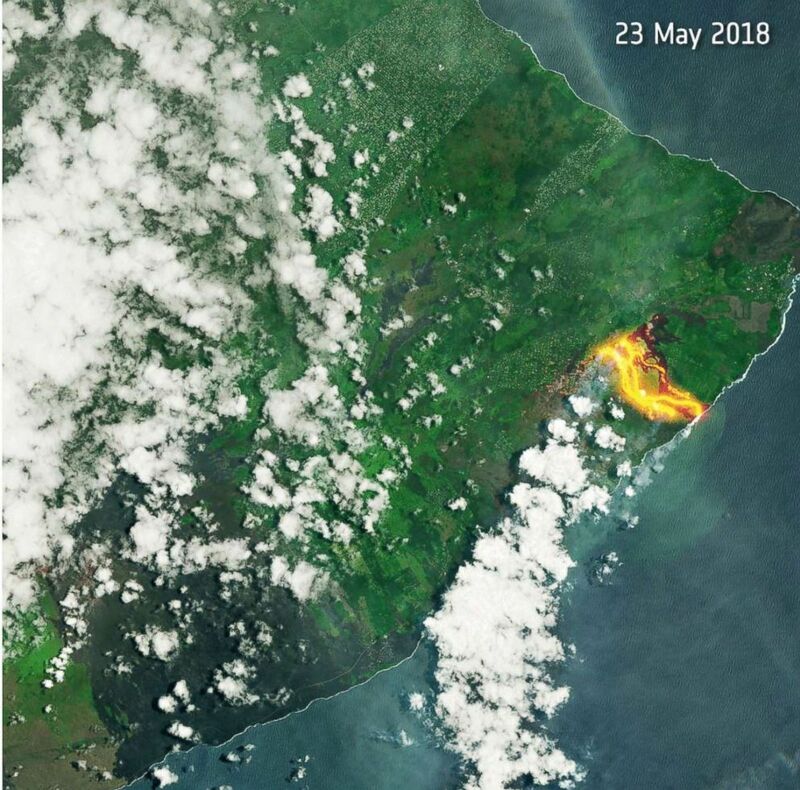 (European Space Agency) Copernicus Sentinel-2 images from 23 May and 7 June 2018 show changes in lava flow from the Kilauea volcano on Hawaii’s Big Island. The volcano is barely visible through thick clouds of smoke in the second photo, taken on Thursday. The smoke is a result of the lava hitting the ocean water, according to the U.S. Geological Survey. The latest eruption began early Tuesday morning and was so powerful that it spewed ash nearly a mile into the air and sparked a 5.5 magnitude earthquake, scientists say. 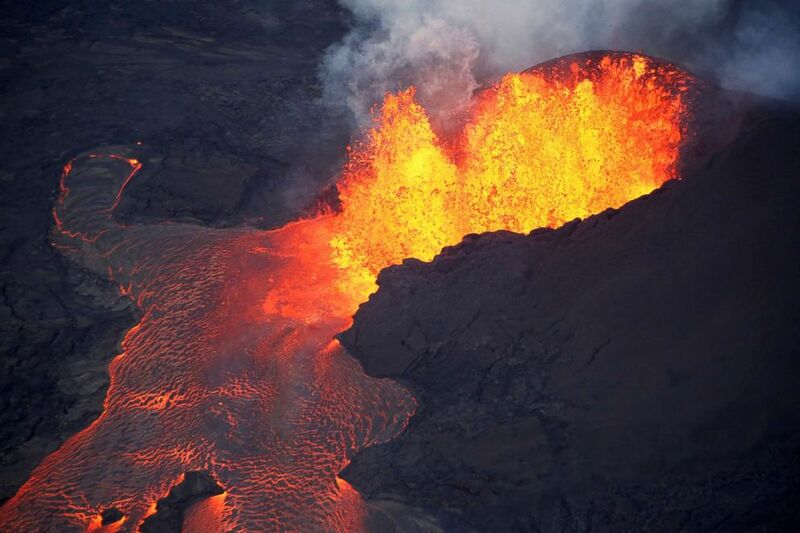 The lava filled Kapoho Bay within two hours after the eruption began and formed a delta extending nearly a mile from shore as it cools, according to the USGS. Lava could be seen bubbling out of the volcano's valve and into a red-hot river flowing into the Pacific Ocean in helicopter video taken on Wednesday. (Terray Sylvester/Reuters) Lava erupts in Leilani Estates during ongoing eruptions of the Kilauea Volcano in Hawaii, June 5, 2018. More than 600 homes have been destroyed since the volcanic activity began in early may. 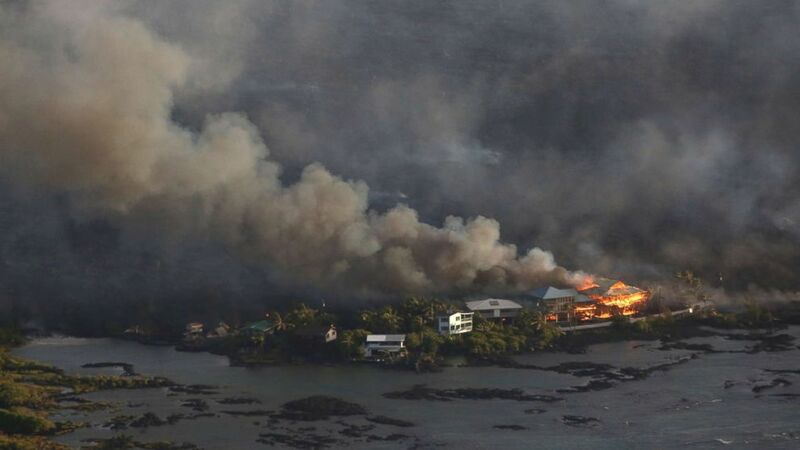 About 100 structures had been destroyed before the latest eruption, but about 500 homes in the communities of Kapoho Beach Lots and Vacationland were in the direct path of the lava. (Terray Sylvester/Reuters) Lava destroys homes in the Kapoho area, east of Pahoa, during ongoing eruptions of the Kilauea Volcano in Hawaii, June 5, 2018. Thousands of people have been evacuated from the area, but up to a dozen residents who stayed in their homes could be dead, officials said. Kilauea is one of five volcanoes on the Big Island and is one of the most active volcanoes in the world, according to the ESA. More eruptions are possible in the coming months as the deflation process continues, Cindi Preller, geologist and duty scientist at the Oahu office of the National Oceanic and Atmospheric Administration, told ABC News.